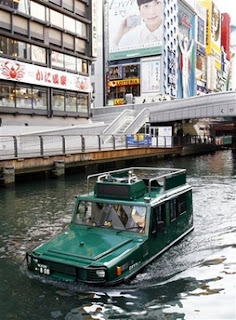 A Rinkya Blog: Amphibious Taxi Debuts In Osaka! No, it is not a sinking car, it is an amphibious sightseeing taxi! Friday will be the first day of tours on the Dotonbori River via an amphibious taxi, the first in Japan. A demo run took place yesterday. The taxi carries 3 passengers and a tour will cost 19,560 yen for an hour. A unique way to see Osaka for travelers to Japan!